DreamWorks Animation’s How to Train Your Dragon fans can soar higher than ever before when Twentieth Century Fox Home Entertainment releases on DVD the first part of the award-winning top-rated TV series, DreamWorks DRAGONS: DEFENDERS OF BERK. Available everywhere March 25, the DVD kicks off the franchise’s “Year of the Dragon” which will continue with the highly anticipated film sequel arriving in theaters this June as well as Dragon game apps, books and other fan experiences releasing throughout the year. The DVD of the 2013 Annie Award winner for Best Animated Television Production for Children is loaded with exciting bonus content for the whole family to enjoy and contains 10 epic adventures and four all-new dragons. Based on the DreamWorks Animation Academy Award® nominated movie How to Train Your Dragon, DRAGONS: DEFENDERS OF BERK PART 1 follows Hiccup and his fellow dragon trainers as they battle to protect their island home. The young Vikings must put their dragon training skills to the test to defeat dangerous and surprising new enemies! The series features original voice talent from the film including Jay Baruchel, America Ferrera and Christopher Mintz-Plasse and will include, Zack Pearlman and more. Defenders of Berk, and the previously released Riders of Berk, is a must-own for any Dragons fan to catch up before the summer event when How to Train Your Dragon 2 hits theatres June 13th! The DVD is jam-packed with special features that dive deeper into the exciting world of Dragons, including Dragon Tracker Part 3 featuring an in-depth look at the Screaming Death, Fireworm Queen, Flightmare and Skrill dragons; Evolution of Screaming Death, a featurette with visual effects supervisor David Jones who explains the history behind this interesting and scary dragon; and the “SuperFly” Dragon Mash-up music video. When it comes to action and excitement, the sky’s the limit in this high-flying animated TV series. Fans that purchase the DVD will also get a Digital HD UltraViolet™ code for the title and an offer for exclusive battle gear and one month’s free subscription to School of Dragons, the online game from JumpStart based on DreamWorks Animation’s How to Train Your Dragon franchise. With cinema-like graphics and an immersive 3D world, it takes more than courage to train a dragon but brains as well. For more information, visit http://www.schoolofdragons.com. Dragons: Defenders of Berk is a Cartoon Network Series that features Hiccup, a dragon trainer who tries to maintain peace between dragons and humans. I've never seen the television series but watched Dragons: Defenders of Berk Part 1 on DVD and was absorbed with the visual effects and plots. There are some scenes that may be unnerving for youngsters due to the scary look of some of the dragons but, overall, it's not a violent show. This DVD set consists of eleven episodes of season one, with a total running time of 242 minutes. It's entertaining and visually stunning. 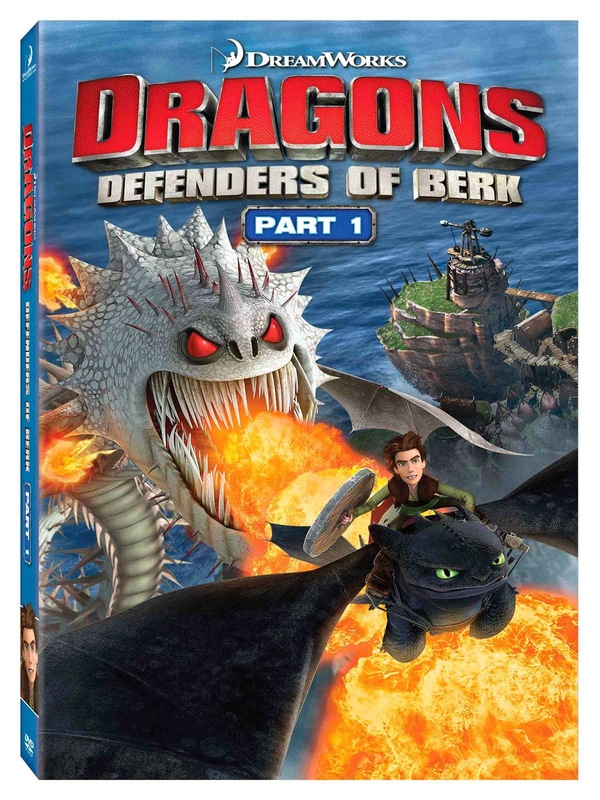 One person will win Dragons: Defenders of Berk Part 1 on DVD. Yes, I do. I really enjoy it. It is well done, and I like watching it. We are not familiar with this series yet. We haven't seen it. Yes, I've seen it with my kids a few times. My son enjoys watching this show. No, I have not seen it but my granddaughter said it is good, and she likes some Dragon named Hiccup. We have not seen the show but have seen commercials for it at my moms home. My son would enjoy it. Thanks! yes my kids love that show they watch it all the time! I have never watched Dragons: Defenders of Berk. My sons watch the cartoon. No I have not seen this on TV before, but it does look good. I have not watched this on Cartoon Network, it looks like something my kids would really enjoy though. We have not seen this but can't wait to watch on dvd! My sons love everything to do with dragons! I haven't seen it, but I am sure my daughter has. We haven't watched it yet but it looks like something my kids would enjoy. My son has watched this and would love to win the DVD! I haven't watched, but my grandchild has. I have not seen it yet but it looks up my alley actually! Yes I have watched it with my daughter. My son watches the show on the cartoon network. I haven't seen it - but my kids have! I haven't ever seen it before. I am tony l smoaks on rafflecopter. I haven't watched the series. I have not seen any of this yet. Thanks so much for the chances to win. Yes, I have watched it with my son. I haven't seen the series yet.. only the movie.